Five specialized courses are now available to give you the skills and knowledge required to pilot drones in positions of public safety or access emerging job opportunities. Students can choose the course that best meets their needs based on their current flight skills and interest in employment-related opportunities. Our hands-on Knowledge-to-Action curriculum, tested and vetted by the State University of New York, gives advanced insight into the business and employment opportunities created by drones. Authorized Federal Government, State, County and Local Government Agencies and other eligible Organizations such as Police and Fire Departments, and Colleges and Universities can take advantage of purchasing our (sUAS) Drone training courses using our (Federal) General Services Administration's (GSA) Schedule 70 Contract Vehicle. 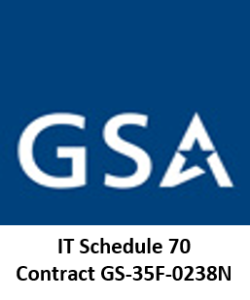 Eligible organizations can view our GSA Schedule Contract (GS-35F-0238N) for course descriptions, discount pricing, and ordering information. If you need additional information or assistance, please contact us at 301.627.5000 or email us at Sales@Telesisinc.com. 18-hour hands-on Intro to sUAS - The 18-hour hands-on Intro to sUAS course takes students from learning to fly drones all the way through to preparing for FAA certification. Students learn to fly safely and legally, understand new jobs and business models, prepare to pass the remote pilot knowledge test for FAA certification, and get the most out of their drones. The course fee includes a quadcopter with a camera and a computer flight simulator. Topics covered include flying multirotor & fixed-wing drones, indoor flight training, diverse flight systems, maintenance, safety, insurance, industry applications, emerging technologies, and the latest FAA policies. remote pilot certification. The course fee includes a workbook, a quadcopter with camera, a computer flight simulator with radio controller, 50 FAA sample test questions, a sample General Order, a copy of First to Deploy – Unmanned Aircraft for SAR & Law Enforcement by Gene Robinson, and 24 hours of instruction. To legally operate a drone in the Public Safety Sector or for any business purpose, FAA regulations now require remote pilot certification. The 6-hour Remote Pilot Knowledge Test Prep course prepares pilots interested in pursuing commercial opportunities to successfully pass the comprehensive knowledge test required for FAA certification. Beyond drone-specific material, students will gain an understanding of much of the ground-school information covered in the FAA’s knowledge test. Topics covered include regulations relating to small Unmanned Aircraft Systems (sUAS); airspace classification, interpretation of sectional navigation charts, operating requirements, and flight restrictions; Learn To Fly aviation weather sources and effects; small unmanned aircraft loading and performance; emergency procedures; aeronautical decision-making and crew resource management; radio communication procedures; physiological effects of drugs and alcohol; airport operations; and maintenance and pre-flight inspection procedures. This course is designed for anyone seeking to fly (sUAS) Drones for personal use. This 12-hour hands-on Intro to sUAS course instruct students on how to fly safely and legally. The course fee includes a quadcopter with a camera and a computer flight simulator. Topics covered include flying multirotor and fixed-wing drones, indoor flight training, diverse flight systems, maintenance, safety, insurance, industry applications, and drone emerging technologies. Course does not include FAA Remote Pilot Knowledge Test Prep. Students interested in pursuing an FAA remote pilot certification and accessing drone-enabled employment opportunities should supplement this course with the Remote Pilot Knowledge Test Prep course. That course, designed to prepare operators to successfully pass the certification test and achieve FAA remote pilot certification, supplements drone-specific knowledge with additional ground-school information covered in the test. The 18-Hours hands-on Intro to sUAS course takes students from learning to fly drones all the way through to preparing for FAA certification. Students learn to fly safely and legally, understand new jobs and business models, prepare to pass the remote pilot knowledge test for FAA certification, and get the most out of their drones. The course fee includes a quadcopter with a camera and a computer flight simulator. Topics covered include flying multi-rotor & fixed-wing drones, indoor flight training, diverse flight systems, maintenance, safety, insurance, industry applications, emerging technologies, and the latest FAA policies. To legally operate a drone in the Public Safety Sector or for any business purpose, FAA regulations now require remote pilot certification. The Remote Pilot Knowledge Test Prep course prepares pilots interested in pursuing commercial opportunities to successfully pass the comprehensive knowledge test required for FAA certification. All training, lodging and meals are provided on-site. Course fee does not include travel to and from the training site. Note: If your organization has eight or more students attending one of our day-time (sUAS) Drone training classes, we may be able to schedule and hold an on-site session at your location. You will need to provide and make available a suitable training room at your site. Contact us for more details. SkyOp develops and licenses drone training courseware to community college workforce development divisions, colleges and universities, and large organizations. The courseware is designed to teach people in the commercial and public safety markets to fly and use drones safely, legally, and effectively. Visit SkyOp.com for more information.